When Connie Rojas '14 arrived at Wellesley, she already knew she wanted to major in biology. She dove right in to her classes and soon found an interest in the discipline’s evolutionary and ecological branches. With support and guidance from faculty, she also pursued opportunities to conduct field research. "Wellesley’s faculty have…mentored me along the way," Rojas said. "Thanks to their advice, knowledge of the field, letters of recommendation, and support, I am where I am [today]." In May, Rojas was named one of 60 recipients of a national Ford Foundation Predoctoral Fellowship. The prestigious award supports three years of study in research-based Ph.D. programs. Rojas recently began a dual Ph.D. program in Integrative Biology and Ecology, Evolutionary Biology, and Behavior at Michigan State University working in a lab that uses the free-living spotted hyena in Kenya as a model species. "As a Latina and a first-generation college student from Oaxaca, Mexico, getting to this point has not been easy. Winning a Ford Fellowship has reminded me that hard work truly does pay off. I am thrilled by the opportunities that will come during graduate school and beyond," Rojas said. She hopes to become a professor of integrative biology and, one day, manage her own lab. This summer, Rojas spent four weeks in the Maasai Mara National Reserve in Kenya with MSU Mara Hyena Project researchers. There she learned to identify spotted hyenas, collect data, and live in a bush camp. "Our potable water was picked up from safari lodges nearby, our shower water came from the river, electricity came from solar panels and batteries, and we all lived in giant tents!" she said. "Everything is in a tent." Since hyenas are crepuscular mammals—most active at dawn and dusk—Rojas was out in the field during those times. 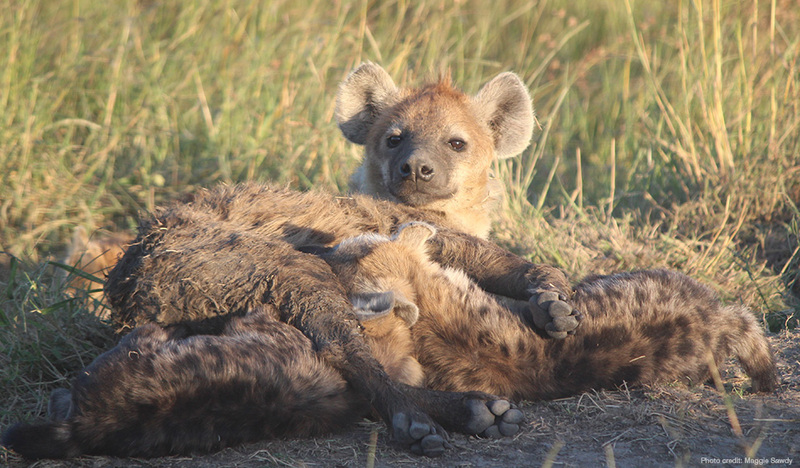 "The field work was demanding, but the sunrises, sunsets, and hyenas were worth it. It was like being on a safari every day," Rojas said. In 2018, Rojas will return to Kenya to begin her own year-long research on spotted hyena social behavior. "These animals are fascinating because they are highly gregarious, their societies are matrilineal and structured by dominance hierarchies, and they cooperate during cub rearing, hunts, and defense of territory," Rojas said. "I plan to study maternal investment, factors influencing female mate choice, or individual variation in stress physiology, and will couple field observations with genetic, endocrinological, or microbial analyses from the lab." Rojas said Wellesley's Office of International Study opened the door for her during a study abroad fair, where she learned about the School for Field Studies Tropical Rainforest Studies program. In the fall of 2012, the program brought her to northeastern Queensland, Australia, where she took courses in rainforest ecology and environmental policy, and lived and conducted independent research in the rainforest. "That kind of started it all. I returned to Wellesley determined to look for additional field opportunities," she said. The following summer, she participated in the NSF-funded Organization for Tropical Studies (OTS): Research Experience for Undergraduates program and spent eight weeks carrying out independent research at La Selva Biological Station in Costa Rica. There, she drafted a proposal for studying the effects of secondary metabolites (chemical compounds found in plants) on the parasite load of frugivorous bats. She also netted and handled bats, collected and analyzed her data, and presented her results in a symposium organized by the OTS. "Wellesley’s courses taught me how to write and communicate clearly, and how to think critically, which is essential for a career in the sciences," she said. During her senior year, Rojas conducted independent research in microbiology, under the mentorship of Vanja Klepac-Ceraj, assistant professor of biological sciences. "That experience with molecular-based research helped prepare me for graduate school, and taught me to perform the lab techniques I use today and will use for my dissertation," she said. Rojas said she appreciates the firm foundation Wellesley gave her both personally and professionally. "The faculty supported me all the way, with advice, information about the field of biology, and letters of recommendation. I was challenged, I was able to be independent, and I was exposed to an array of opportunities," she said. "One experience led to the next and eventually brought me to the Ford Fellowship, spotted hyenas, and my unique career trajectory."